While U.S. Treasury Secretary Steven Mnuchin is at work on Trump’s upcoming proposal to reform the Amercian tax system, he continues to be caught up in controversy over his rich lifestyle, his pretty third wife’s haughty attitude and demands from those he went to school with who want him to quit his job in protest. First, there was a letter in late August from more than 300 of his former Yale classmates calling on Mnuchin to quit in protest after Trump’s racist remarks about what happened in Charlottesville. Now a month later, Mnuchin’s classmates at the exclusive Riverdale Country School, the private high school he attended in Westchester County north of New York City, have written urging him to resign. The letter comes days after Mnuchin, 54, used his upbringing as the son of a multi-millionaire investment banker as evidence he didn’t really commandeer a government jet for a trip to Kentucky as a fun junket with his 36-year-old actress wife. During a recent conference sponsored by Politico, Mnuchin said the trip to Kentucky had originally been scheduled for a different day but had to be re-scheduled. Then in a put-down of the people of Kentucky, smacking of his sense of entitlement, Mnuchin he said he actually had little interest in seeing the eclipse. However, Mnuchin did view the eclipse along with his wife and Senate Majority Leader Mitch McConnell of Kentucky during a visit to Fort Knox. Mnuchin said he changed his initial plan to watch from the roof and instead looked at the moon blot out the sun “briefly” from the ground using a pair of glasses he was provided. Mnuchin did not explain how look at the place where about $200 billion in gold is stored helped him do his job, or why he brought his wife along if it was really a business trip. The letter also compared Mnuchin’s actions after Charlottesville to those of Gary Cohen, a fellow former Goldman Sachs banker, who is now director of the National Economic Council. Cohen publicly criticized Trump for his racist comments and since has been getting the cold shoulder from the president. Contrast that with Mnuchin’s reaction to his Yale classmates who said he had a moral obligation to quit Trump’s cabinet. Mnuchin responded with a statement in which he denounced hate but defended the president and in which he refused to quit his job. That obviously didn’t reassure his former high school classmates. Mnuchin asked for a government plane and crew to take him and Linton to Europe where they were going on a honeymoon, with the first stop in her home country, Scotland. 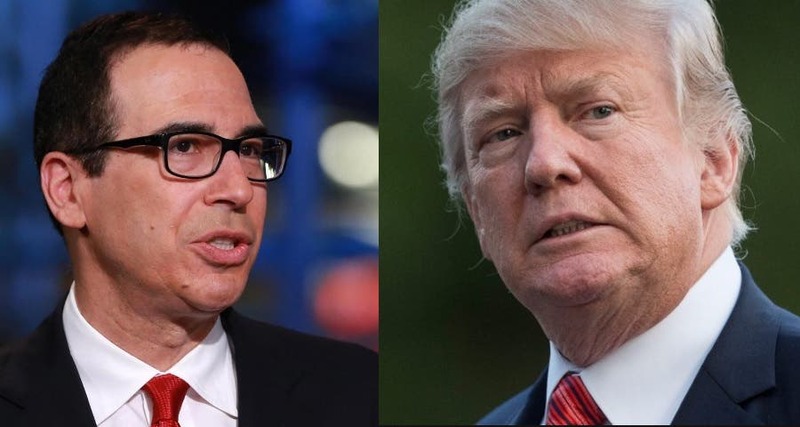 While Treasury Secretaries have used government aircraft for overseas trips on official business, Mnuchin’s excuse was that as a member of the National Security Council and other sensitive government agencies, he needed to be in constant contact with Washington. Mnuchin later backed off on that request after claiming he had found other ways to keep in communication with the president and his official duties. Mnuchin, whose wealth has been estimated by Fortune Magazine at half a billion dollars, married Linton in June in a ceremony officiated by Vice President Mike Pence and attended by Trump and many members of the cabinet and White House senior staff. Linton had already raised eyebrows when she participated in an article for Town & Country magazine detailing all the expensive jewelry Mnuchin had given her. That exploded into a national scandal after Linton went on Instagram with a picture of herself getting off the government plane in Kentucky that detailed all of the expensive clothing, jewelry, and shoes she was wearing, with hashtags identifying the luxury designers. When she was criticized by an Oregon housewife and mother of three who wrote “glad we could pay for your little getaway,” Linton blasted back with a nasty, arrogant diatribe. “Pretty sure the amount we sacrifice per year is a lot more than you’d be willing to sacrifice if the choice was yours,” wrote Linton. After that made international headlines and brought widespread condemnation, Linton apologized for her remarks to the Oregon housewife. Mnuchin came to his job in Washington after a career on Wall Street, running hedge funds and as chairman of a California bank that had a reputation for foreclosing on thousands of customers, many of them elderly, with ruthless efficiency. In Washington, Mnuchin has earned a reputation as a true Trump loyalist, complimenting Trump at every opportunity, while ignoring the president’s many outrages. In a cabinet full of multi-millionaires who are barely qualified for their jobs, Mnuchin stands out as being just as sleazy, morally bankrupt and arrogant as his boss. He may get to put his signature on the dollar bill but Mnuchin’s currency with the American people is dropping faster than the Dow Jones index did in 1929.